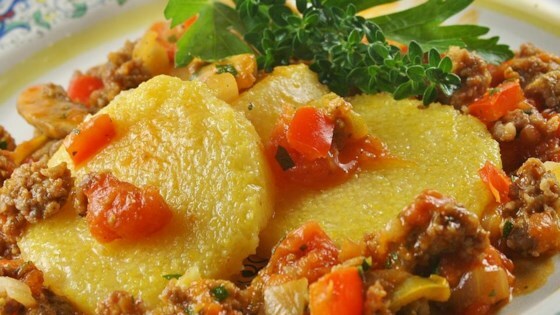 "Refrigerated polenta with a stove top sauce. We prefer the flavored polenta and spicy Italian sausage and also use spicy Italian seasoning to give it some more kick, but you can also use the regular sausage and Italian seasoning. This will serve 4 to 6 people." Spray a cookie sheet with cooking spray. Arrange the polenta slices on the sheet and spray them lightly with cooking spray. Broil until lightly browned about 5 minutes; turn and broil other side for 5 minutes. Keep warm. In a large skillet over medium heat, cook the sausage, breaking it up as it browns. When sausage has lost any pink color, add the onion, bell pepper, mushrooms, zucchini, and Italian seasoning. Cook until vegetables are crisp tender, 5 to 7 minutes. Stir in the spaghetti sauce and cook until heated through and just starting to simmer. To serve, spoon the sauce on slices of polenta. Top with a sprinkling of Parmesan cheese. Will make it again, but hubby didn't rave over it. I used turkey sausage, not hot. That would have been too hot for us. I did use 25 ounces of spaghetti sauce.A good, rather healthy dish..
We enjoyed this last night! I used a vegetarian sausage and made the polenta for more flavor. This is a quick recipe that you won't feel guilty about! Yummy, yummy, yummy. Who needs pasta when you get polenta? !